We all know how commercialised public space in Singapore can be, but the latest travesty along Orchard Road is really a madcap leap into a whole new world of abject silliness. 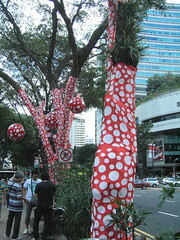 The poor, stately angsanas now have their tree trunks inexplicably wrapped in red-and-white polka-dotted cloth, and there are strange large balls with the same pattern hanging from the branches. Whoever thought up this advertising tactic succeeded in making me stop and take notice, but loses points for violating the dignity of the trees and not actually advertising, it seems, anything in the first place. Surely it’s too early for Xmas decorations and it can’t have anything to do with that asinine Four Million Smiles campaign. So what else could it be? I like how the trees revenge with their sap, which has bled into the cheap, synthetic fabric, making it look even more worn and even cheaper. I like the garishness of it (our national colours) – which adds to the vulgarity when short tufts of that parasitic plant on the trunks spill out, the forked branches like parted legs. Plus those dotted globes, like recycled christmas/toadstool decorations – mocking the annual get-up we subject our streets to every festive season. Yet the work is still celebratory. At the superficial level, it decorates and “adds cheerful colour” and demands attention. It can be seen as just whimsy.